An emotional Antonio Winterstein has announced his immediate retirement from the NRL due to an ongoing knee injury. 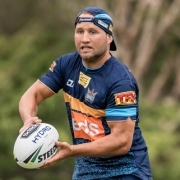 The North Queensland winger choked back tears as he addressed a press conference in Townsville on Wednesday. “Due to medical advice and based on recent scans and c﻿onsiderations of my health and well being for the future, I have made the difficult decision to retire,” Winterstein said. “Firstly I would like to thank my entire family, especially my wife and my three beautiful children for allowing me to live out my dream. “For the players at this club, you guys are what make the club what it is today. Thank you for making my time here very special. After two Grand Finals, 213 NRL games and 97 tries, Premiership-winning winger Antonio Winterstein has announced his retirement, effective immediately. Winterstein finishes his distinguished career with a glittering resume which includes 214 NRL games, 167 of which came in Cowboys colours. The 30-year-old joined the club prior to the 2011 season and quickly became a fixture on the left wing. In a four-season stretch between 2013 and 2016, the Samoa international amassed an astonishing 57 tries, highlighted by a 16-try haul in 2015, the same year the club secured its history-making maiden premiership victory. 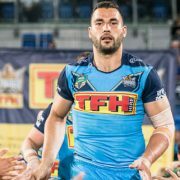 Winterstein finishes his Cowboys career with the fifth most tries in club history, behind only club legends Matthew Bowen, Ty Williams, Ash Graham and Johnathan Thurston. After battling a persistent knee injury throughout his career, Winterstein said that in the past three months there had been a significant increase in pain and movement in the joint had been restricted even further. After undergoing fresh scans in recent weeks, Winterstein heeded the advice of club medical staff to call time on his career in the best interests of his long-term health. 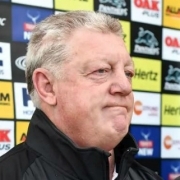 Cowboys Director of Football Peter Parr said Winterstein was an instrumental contributor to the club both on and off the field during his eight-year tenure as a Cowboy. “In Antonio’s first seven years at this club we played finals every year – that’s not a coincidence,” Parr said. Cowboys head coach Paul Green echoed Parr’s sentiments. “He has been a fantastic player, a premiership-winner, the epitome of toughness and a great team man,” Green said.